Here are nine Toronto events ranging from the Rogers Cup at the Rexall Centre to Coconut Festival Canada at the Wychwood Barns! Celebrating summer in Toronto and the arts, 75 artists & artisans from across Canada are gathering at the Historic Distillery District for three days only. 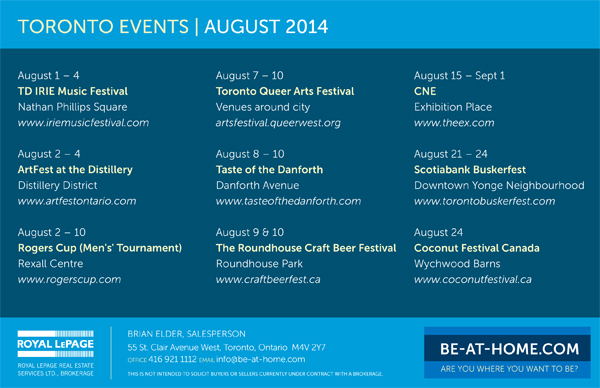 The Queer Arts Festival in Toronto is an annual showcase of queer arts, culture and history. It celebrates the unique creative expressions of visual and performing artists who identify as part of the queer communities. Events range from smash poetry to a film festival and take place across the city. Taste of the Danforth celebrates 21 years with Canada’s largest street festival. Expect live performances, great food and about 1.5 million people. Roundhouse Craft Beer Festival was created to provide beer lovers the opportunity to sample Ontario’s finest craft brews and delicious eats from Toronto’s best Food Trucks, all in a pleasant park setting. Two dozen breweries will be represented (pace yourself!) plus fourteen food trucks including Smoke’s Poutinerie and Sugar Mamma’s. The CNE is a Toronto tradition. Every year the food vendors try to outdo themselves with an unusual food item. Let’s hope this year’s offering doesn’t come with a side of e. coli. Among the performers this year at the Bandshell: Hanson, Platinum Blonde, Tom Cochrane, Christopher Cross and Jose Feliciano. 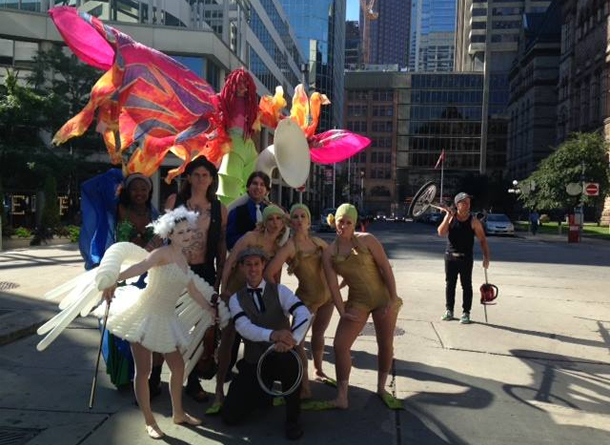 Buskerfest closes down part of Yonge Street for three days to raise money for Epilepsy Toronto. There is always a wide range of performers and this year, they have valet parking – for bikes! This is Canada’s premier festival for coconut lovers. Learn about the health benefits of coconuts. Fun fact: Coconuts aren’t actually nuts, they’re a fruit. Most people with tree nut allergies can eat coconuts.